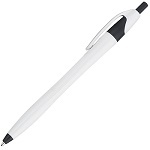 Best selling pen style - this European design ballpoint click pen features a silver hour glass shape barrel with colored accents. 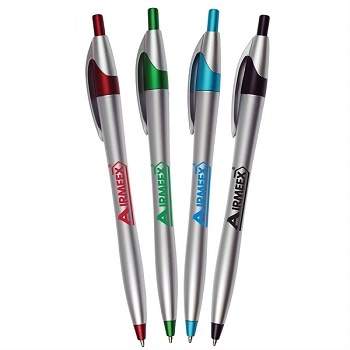 The sophisticated design of this pen makes it ideal for any promotional advertising. 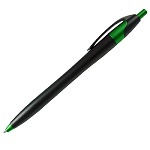 This popular style click pen writes smooth with its medium 1 mm tip and German ink. European design ballpoint pens are the perfect way to put your message directly into the hands of your employees, customers and supporters! Call or Text 706-258-7041 for Assistance and a Free Quote. 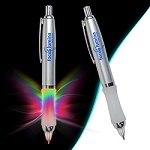 Price includes a 1-location, 1-color imprint only. All type must be at least 8pt. If printing a logo, please provide in high-resolution vector file format to avoid additional charges. Imprint Size: 1.375"w x 0.875"
Standard Imprint Colors: Process Blue, Reflex Blue, Blue (2935C), Navy (281C), Red (200C), Green (355C), Dark Green (357C), Purple (2603C), Violet (2685C), Maroon (208C), Yellow, Black, White, Gold, or Silver (877). Custom Imprint Colors: Additional $35 charge applies. Must provide PMS #. Exact match cannot be guaranteed. All PMS colors may not be available. Production Time: Approximately 5-7 business days after proof approval.